as some of you may know, i'm going on holiday to florida on the 29th of march (fifty something days, eep!). i went to florida in 2009 and one of the best things about remembering it is that i looked good in all of the pictures. i had my hair quite short and i had a sweep fringe and i tied my hair up nearly everyday and somehow it always looked decent. since i found out we were going, i've been constantly debating with myself on whether or not i should cut my hair short again. the holiday photos from 2009 were the only holiday photos that i've ever looked good in and i'm pretty sure it was because of the hair. considering this is definitely the last time i'll get to go to florida with my parents, i want the photos to be good, and i don't want to look a mess, which is usually how i look with my current hair the very second i leave my house. okay i know my hair doesn't look the best here (stupid bit of my fringe in my face gah!). it looked better in other pictures but they had my family in them and i wasn't sure if they'd want to be put on the internet. my only concerns with cutting my hair are, a) i was 14 in 2009, and since i'm 17 now, i'm scared that short hair might make me look 14 again, and, b) i'm worried it might not suit me or look as nice. so before i take the plunge with my scissors, i set out on a mission to try and find some up-do's that work with long hair and suit my face. awkward hand, why?! the colours were a bit off, hence the black and white, by the way. 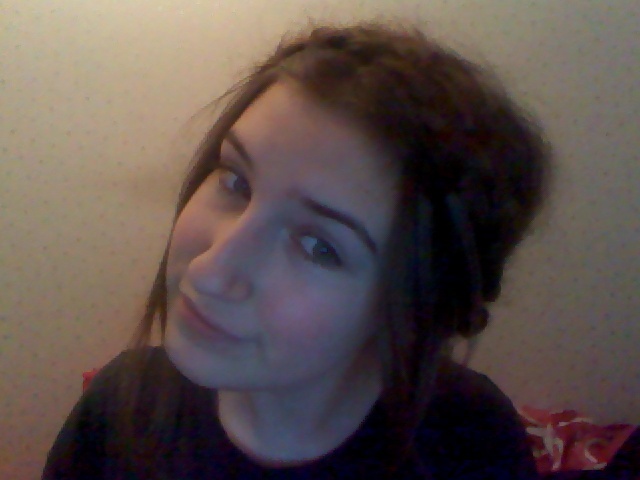 my first attempt was the classic mary-kate and ashley plait up-do. i'm not a master at using hair-grips and they always fall out or just sit in my hair and don't really grip anything, so i'm not sure about this look. i used this tutorial to figure out how to do it. it's actually a lot easier than i thought it'd be.